Sally Field stars as Betty Mahmoody in Not Without My Daughter. By all indications, Not Without My Daughter should be a forgettable movie. It was a major motion picture when it premiered — 25 years ago today — starring one of the most-adored actors of the era, Sally Field, coming off the hit Steel Magnolias. But its $4 million opening weekend barely made a dent in the box office; it was largely critically panned for its Islamophobic undertones; and in re-airings, it could easily be mistaken for a Lifetime movie with a timely political pitch: Woman escapes from abusive Iranian husband, scary foreign country, and the evil clutches of Islam. In the larger cultural imagination, the film was consigned to oblivion. But Not Without My Daughter has its own curious legacy. Over the years, it’s been shown in schools, re-aired on television, and notoriously played in Paris the night before the 1998 USA versus Iran World Cup match. One journalist responded to Iranians’ concerns over the World Cup airing with, “Oh, shut up,” arguing that the film was so unremarkable, grievances were “illogical.” But whereas some could easily disregard it, others were captivated by the film’s “woman in peril” narrative, with Field at the center. It endured in the years following its January 11, 1991, release as a troubling albatross for Iranians that, often, was presented as evidence of the barbarity of Iranian men. “For Iranian men of my generation and American moms of my mother-in-law’s generation, this is a film that has seared itself into our consciousness,” says Reza Aslan, an Iranian-American author and religious scholar. Upon the film’s 25th anniversary, it’s an interesting case-study of how early misrepresentations of an ethnicity in popular culture — one that the American public previously had no concept of — never really leave them. Not Without My Daughter is set a handful of years after the 1979 Iranian Revolution, which turned the nation into an Islamic state, prompting a mass exodus of Iranians. Adapted from Betty Mahmoody’s memoir of the same name, the plot pivots on a sinister manipulation: Iranian-American Sayed, better known as “Moody,” convinces his wife to travel with him and his daughter, Mahtob, for a vacation in Iran, promising to return to their Michigan home two weeks later. Once there, his personality takes a 180. Moody, rededicating himself to Islam, reveals his intention was always for them to stay in Iran for good. He won’t let his wife and daughter leave, and becomes physically abusive toward Betty when she resists. 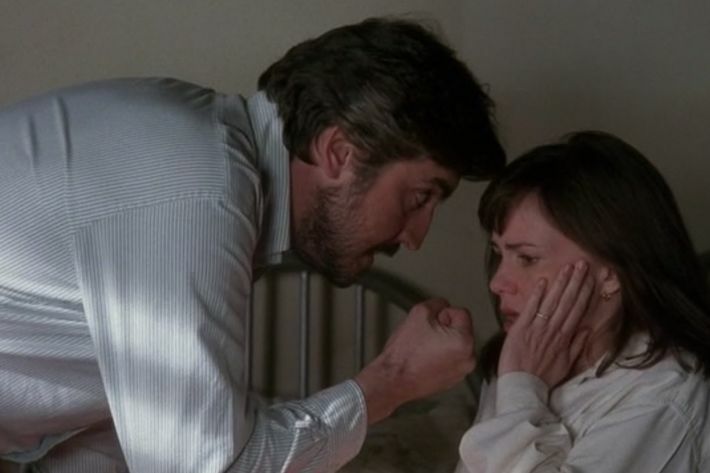 Alfred Molina (left) and Sally Field. At the time of the film’s release, “Iran was our primary bogeyman,” Aslan explains. “The Cold War was over; we weren’t made aware of China’s rise in a significant way; there was no such thing as Al Qaeda or jihadist. None of that existed yet, so Iran had become the primary foil for America.” Prior to Not Without My Daughter, the Iranian hostage crisis was the most exposure Americans had consistently had to Iranians (aside from the Iron Sheik), and NWMD’s narrative fit neatly into the notion of Iranian-as-hostage-taker — except this time, it could happen right in your own home. It’s not just Iranian men whom NWMD gives a bad rap. It paints a severe, borderline grotesque image of the Iranian people, from the moment Betty and Moody step off the plane and a horde of men and women in full-length black chadors ominously surround the couple. What’s unique about the film is that it shows Iranians at home, the implication being: This is how they really are. “It’s all so primitive,” Betty remarks at one point as she absorbs the culture around her. The few good-hearted Iranians that help her escape are presented as exceptions to the norm, and only because they’ve had exposure to the West. In one almost comically demonizing scene, Betty pleads to her husband’s family for help and they bark at her in Farsi, none of which is subtitled in the film (though knowing what they say wouldn’t make it any better), as the camera zooms in on their furious faces. Throughout the ’90s, this image was many Americans’ first introduction to Iranian culture. Dr. Nacim Pak-Shiraz, the head of Persian Studies at the University of Edinburgh, wrote about how formative the film was in shaping Westerners’ view of Iran in her book, Shi’i Islam in Iranian Cinema: Religion and Spirituality in Film. She remembers having conversations with Americans in her graduate program in Islamic Studies in 2000 that would “inevitably lead to invocations of Not Without My Daughter as if it were the only valid source available to understand the socio-political context of Iran and Iranian women,” which, as Jobrani notes, is a culture that definitely includes misogyny. That said, the film didn’t attempt to capture the complexities of the situation in Iran, or its people. The film was a part of a number of social-studies and religion curriculums, though it’s unclear with how much regularity. An Iranian-American girl, interviewed for an academic book on tweenhood, said she was “highly embarrassed and shamed” by a teacher’s screening of the film. For many Iranian-Americans, the details of the film itself are now a vague memory — one movie released a quarter-century ago does not stand out when piled upon with stronger rhetoric. Even at the time, Iranians may have been upset, but the responses were more to “turn your head the other way, put your head in the sand, try to ignore it, and hope that it goes away,” Aslan says. “In those days, the notion of taking pride in your identity as Arab or Muslim or Persian didn’t really exist because there wasn’t sort of an overwhelming nationwide kind of demonization of an entire religion or race or culture that there was after 9/11.” Jobrani adds, “A lot of Iranians viewed it negatively, but they just laughed it off as Hollywood cinema.” If the film were to come out today, Iranians would be more likely to control the narrative around the film. “You would see a far different response from the Iranian-American community than you saw 25 years ago,” Aslan says. Part of the lingering resentment toward Field was due to how overwhelmingly beloved she was — Iranians grew up with Gidget, too. A reviewer at USA Today praised “our gal Sal” for “a believable, heart-tugging performance” in NWMD. Jay Boyar at the Orlando Sentinel wrote: “When Field acts strong and determined, we think of her in Norma Rae and Places in the Heart. When she’s confused, we think of her in Sybil. (And when she’s dressed in a robe, her head covered with a hood-like chador, we remember her Flying Nun habit. )” He concludes, “if there have to be exploitative movies, they should all have at least this much going for them.” It’s a perplexing statement: that exploitative movies should be evocative, which is exactly what ensured Not Without My Daughter would resonate through the years. #gem #terrorist #Muslim "not without my daughter" as if that wasn't a heads up. God love a bit of sally field l.
This is a movie all ladies of all ages should see right now. 'Not Without My Daughter' It's an older movie but applies now! An earlier version of this piece stated that the film’s opening weekend grossed $15 million — that was in fact its lifetime gross.